The Duke and Duchess of Cambridge have named their son, Prince Louis Arthur Charles. It’s been reported that the Duke and Duchess of Cambridge have given birth to a baby boy. The little Prince was born at St Mary’s Hospital this morning. 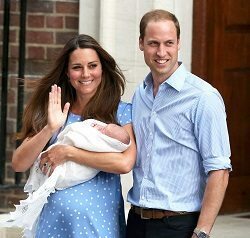 It was announced this morning that Kate Middleton was admitted to St Mary’s Hospital, Paddington, London earlier this morning in the early stages of labour. Last week the hospital put up road blocks which prevented cars parking outside the hospital. This gave some credence to rumours that the Duchess would go into labour shortly. Royal Baby Boy or Girl? Although there is still no word as to whether or not the Duke and Duchess of Cambridge are having a boy or a girl, the rumours as to what name the little prince or princess will get are flying about with abandon. Currently, Arthur takes the top spot for the boys, and Alice is in the top spot for the girls. Very quickly after the announcement was made on Twitter, the world’s media gathered outside the hospital. Hoping, no doubt, to be first with the news of the arrival of a little Prince or Princess. What happens after the Royal Baby is born? Following birth most parents spend time in hospital bonding with their newborn and celebrating the arrival with close family and friends. This is no different for the Royal Family. Kate and William have scheduled exactly one hour after the birth of their third child where they won’t be bothered by any staff, doctors, nurses or midwives, ensuring quiet time with their new baby. Prince Charles and Camilla, Duchess of Cornwall will visit the new baby, as will Kate’s parents Carole and Michael Middleton. For both Prince George and Princess Charlotte’s birth, Kate’s parents got the first visit with the baby after Prince George, of course! We wonder who it will be this time? The Duke and Duchess of Cambridge will have a quiet month to look forward to with their family following the birth of their third child. Both William and Kate have been ‘putting in the hours’, so-to-speak, attending royal engagements for the months of March and April. This gives them some time off in May to bond with their new baby, and introduce her to Princess Charlotte and Prince George. After all, those first few weeks with a newborn are busy enough – even for the Royal Family!